Save on furniture and accents for every room of your home. Now is a great time to save. We have taken strong markdowns on merchandise in all categories. Hurry for best selection. New shipments are arriving weekly. We must make room for the new arrivals. 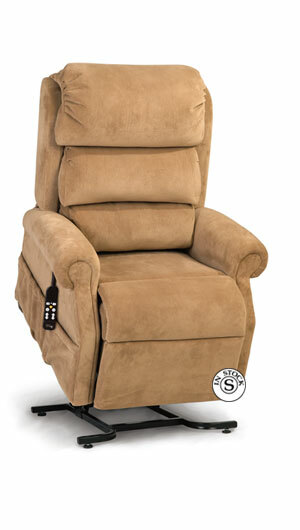 Shown below is one of the many power lift recliners that we have sale priced and in stock at Carter's. Wide variety of styles, colors, and sizes in stock for immediate delivery. Made in the USA. As many of you will recall, Carter's has often displayed merchandise at the Homearama in nearby cities. Carter's teamed up once again with the Joey Corp and the Closet Factory to showcase one of the recent Homearama's most stylish homes. Shown above is the exterior view of "The Suffolk House" (house # 5) where Carter's supplied the furniture. By special request shown below is a detail picture of the curio in the master bedroom. Measures 84" tall and 44" deep. Great quality and beautiful design. Shown above is the master bedroom featuring a lighted display cabinet with a wood branch design, two storage drawers, and adjustable glass shelves. The king size upholstered bed is available in over a hundred fabrics, 6 choices of nailhead trim, and 5 different wood leg finishes. (also available in queen size and available as headboard only.) The bedside chests and lamps are also from Carter's. 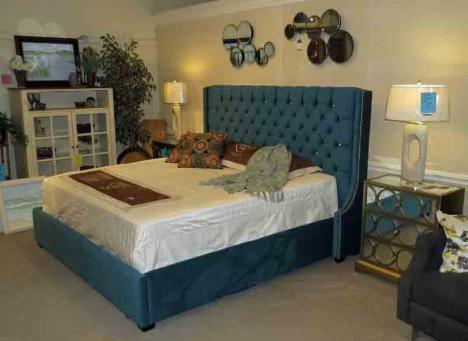 The bed shown above is now in stock and sale priced at Carter's in a beautiful teal fabric with pewter nail head trim and glass button tufting. You can custom order this bed in your choice of fabrics, leathers, finishes, and nail trims. Available in king or queen sizes. Lamps, mirrors, and mirror front bedside chests also sale priced. Also available with crystal button tufting in top grain leather! Visit either of our 2 stores you're sure to find the latest designs and the best prices. Is proud to announce that we participated in the fall "Parade of Homes" in cooperation with Chesapeake Homes and Interior Visions INC. The show was located in the Cypress Creek community of Smithfield, Va.
We would like to thank the Peninsula Builders Association, Chesapeake Homes, and Interior Visions, INC for the privilege of working with them at the Parade of Homes. What is 8 way hand tied? 8-way hand-tied coil springs...The top quality companies will use an "eight-way hand-tied coil spring" construction which is widely viewed to provide the best overall comfort and durability. In plain English, this design uses heavy coil springs made from heat tempered steel which are attached to steel bands that run across the bottom of the frame both front to back and side to side. These coil springs are then connected to each other and/or to the frame with a heavy cording that is hand-tied in 8 different directions to provide a very comfortable "ride" with great durability. This is the quality that is often passed from generation to generation. Click on our terminology page above for additional information and a labeled illustration of Masterfield's 8-way hand tied coil springs. We would like to thank the following local artists for participating in Carter's Art Show and Sale. Suffolk artist Suzanne Baur and Harriette Laskin, clay; Tommie Kay Dudley, Linda Glaser, Debbie Hobbs and Patricia Outland, pastel and Iris Mamlin, painting. Other artists exhibiting included painters C. Edward Vann, formerly of Suffolk and now living in Norfolk, Penny C. Duke – aka Topaz of Isle of Wight, Beth Brown of Virginia Beach, and Michael (Mick) Grochowski of Norfolk. Friend our facebook page at Carter Furniture, Inc. for updates. New shipment of power lift recliners and power recliners have arrived; included in this new shipment are comfort features such as the zero gravity position, the television or TV position, and the infinite combinations available due to the independent control of the leg rest and back positions. 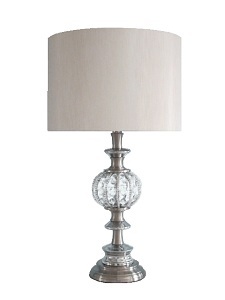 New shipment of Lamps, Pictures, Mirrors, Area Rugs, and accent tables just arrived. Hundreds of reductions for every room of your home. It is with great pride that we participated in the Summer 2012 Homearama at "Culpepper Landing" in the Deep Creek section of Chesapeake. 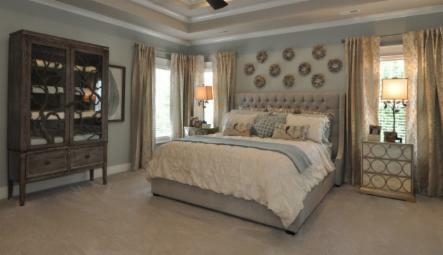 You saw the newest trends in color, design, and innovation at the Fall 2011 Homearama. New shipment of Oak bedroom just arrived with matching TV Stand. 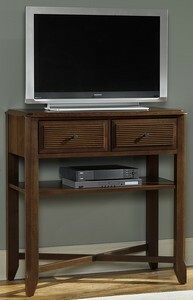 TV Chest in stock in Light Oak and Dark Walnut. Welcome to Carter's Website; this site features merchandise for Carter's Quality Shop. You may also wish to visit our other websites...see below for links. Just arrived in time for your special orders of quality upholstery made in the USA....new 8 way hand tied coil spring upholstery from King Hickory, Temple, and Masterfield. You'll be impressed by the extensive array of styles and fabrics offered by the top quality U. S. A. upholstery manufacturers. New dinette shipment just arrived; click on our dining room tab page or look us up on Facebook(Carter Furniture, Inc) for new pictures of some of the items. Like us on "Facebook" for special exclusive Facebook offers. 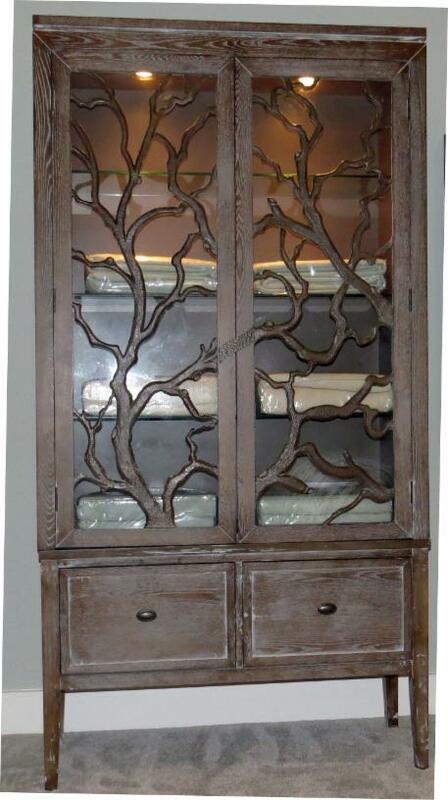 Also visit Carter Furniture, Inc. on Pinterest. Our Friendly Staff will be happy to assist you with your furnishings needs. "Quality Furniture at Sensible Prices Since 1958"
In-store financing...many options to fit your needs. Quick convenient delivery...experienced friendly staff... We're very proud that our deliver staff consistently strives to provide the best service possible. And a special thanks to the customers that call to let us know how much they appreciate the care and the courtesy provided. Friendly knowledgeable sales staff...we have the patience and the desire to help you make the correct home furnishings decisions. Large selection of in stock merchandise...one of tidewaters largest selections of traditional, transitional, and contemporary furniture. Special Orders...your choice of thousands of styles and fabrics. Terminology...this page provides information regarding construction quality, etc. Site updated June 25, 2016. We wish to thank all of the visiters that toured "The Suffolk House" which featured furniture by Carter's Quality Furniture at the 2014 Homearama at "The Waterfront at Parkside" at Bennett's Creek in Suffolk off Shoulder's Hill Rd. It is with great pride that we participated in the Fall 2011 Homearama at "The Riverfront at Harbour View Suffolk" and at the Summer 2012 Homearama at Deep Creek and the Fall 2013 Parade of Homes at Cypress Creek in Smithfield, VA.